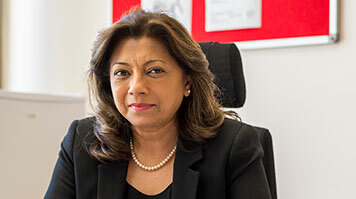 The newest Honorary Doctor to join the LSBU School of Law and Social Sciences is Her Honour Judge Karu (Usha Karunairetnam) who is recognised for her outstanding contribution to the law both as a criminal barrister and latterly as a member of the judiciary. She is currently Resident Judge at Inner London Crown Court and Recorder of Southwark. "As a judge you can make a real difference in a person’s life. For example, if you pass a suspended rather a custodial sentence, and that person doesn’t go on to re-offend, you’ve given them the opportunity to change their life for the better. That’s why I’m so deeply involved in the justice system and committed to doing the very best I can. "Having been a criminal barrister serves you well as a judge, but the skills you need are different. If you understand what the advocates are doing it helps tremendously but as a judge the key qualities you need are patience, the ability to listen rather than impose your own views, to be a good manager (you are managing the courtroom and jury), resilience to deal with the heavy workload and the ability to get on with all kinds of people. "I’m a Diversity and Community Relations Judge as well as Senior Judge at my court. This means I try to build connections with local schools and multi-faith community organisations, and to make the law more user-friendly for them by bringing it out of the courtroom. I run a ‘Day in the life of a judge’ session where schoolchildren get to spend a morning in court and ideally see a sentence being passed. Then they do a few exercises with made-up cases where they act as judge and decide what the sentence should be. "My work as a member of the Mental Health Tribunal is fascinating. I work with a consultant psychiatrist and a specialist lay member, holding face-to-face hearings with people detained under the Mental Health Act to decide whether they are ready to be discharged. It’s also closely connected with the work we do in the courts. For example we may pass hospital orders, or have to deal with mentally disordered defendants in court. This helps me to see the other side and get an idea of what kind of help is available and how people might fare in hospital. "My father is an inspirational figure for me. He was always patient, hardworking and broadminded. He worked in government service in India and then took on a role with International Planned Parenthood Federation and subsequently with the United Nations. He came to England in 1975 and my mother, three siblings and I followed in 1976. His priority was always to look after his family. He never made me or my two sisters feel any less important than our brother and has always been tremendously supportive. I also saw how he took responsibility for the care of his own parents and siblings (he was the eldest of 10) with great kindness and modesty, and that has stayed with me throughout my life. "I look at my sons (who are both criminal barristers) and I think young people living in London are lucky to have such a cosmopolitan environment. When you meet so many different types of people I think it helps you understand what it means to be human. That lies at the heart of a good legal and judicial system – it’s so important not to pre-judge. "In the early years of my career, there were definitely barriers to progression. I came to Bar in 1984 and it took me several years to get a pupillage. At that time there were very few non-white barristers in London – it was a very different world. When I was ready to think about a judicial career I first took on the role of Assistant Recorder, and then Recorder when the assistant role was abolished. I became a circuit judge in 2005. "The criminal justice system has been badly affected by diminishing resources, so if you want to make a good living go into other areas of the law. But if criminal law is what you love, there’s still nothing like it. The buzz of defending a client and getting an acquittal is incomparable. The colleagues and camaraderie at the Bar are great and the work is fulfilling and meaningful. Throughout my career I’ve never had a day when I wake up and don’t want to come to work. "Digitalisation is affecting the criminal justice system profoundly. Could a computer ever pass sentence on a defendant? It will happen, I think, but maybe not in my lifetime. Luckily in criminal law we have the jury system, which keeps things more personal and present, but I am concerned about the reduction in face-to-face proceedings generally because it’s easier to say no to someone, or not take time to understand their point of view, if they are not in the room with you. "I’m keen to build up a connection with LSBU students. I’d like to start a tradition of students coming to the courts and hopefully also getting judges to come and speak at the University. Our locations so close and I think more events and exchanges would be beneficial for both institutions."